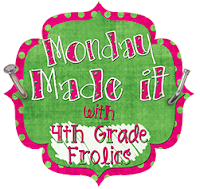 Anyway, I am linking up again with Tara from 4th Grade Frolics, for today's Monday Made It. 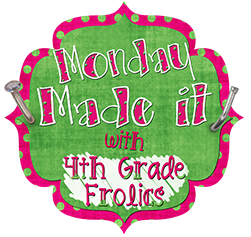 My "Monday Made It" is my new Substitute Teacher Binder. I love how cute the pages turned out! :) Once I get all of my new information for the school year put inside it, it will be very helpful for any substitute that I might have this next year. Your sub binders looks great! Thank you Mechele. I just followed your blog; I will definitely be back to check it out again. It's super cute! Do you have a tpt store? Thanks Marlene. I need to set up a TPT store. I have other teachers asking for some of the things I have made or redone. I need to look into setting that up. Cute stuff! Thanks for the inspiration! I saw the idea on someone's blog or teacher store, but I made my own to be a beach theme to match my classroom. It turned out cute, and will be nice to have it all in one spot for a sub. I definitely need to make a sub binder this year. That's on the top of my to do list. Your binder looks great! Thanks Lisa; I know I saw a pirate themed one somewhere. :) When does your school begin? We start on 8/23 with our kids.